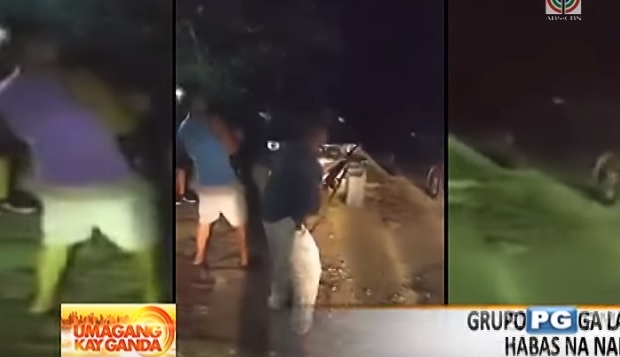 MANILA, Philippines- The Pangasinan Provincial Police Office (PPO) has identified one of the men seen indiscriminately firing guns in several videos that emerged online. Indiscriminate firing caught on video. Screengrab from Youtube. In the videos that have since gone viral, several men speaking in Filipino and Ilocano were caught taking turns in firing two rifles into the air in the presence of onlookers. The controversial 39-second video uploaded on the Evan Demata Facebook page on Sunday, January 3 earned the ire of netizens. One of the men was identified by Senior Superintendent Rolie Saltat, officer-in-charge of the Pangasinan PPO as Eduardo Quinit. However, it was established that Quinit no longer lives in the Philippines and has migrated to Guam since 1996. According to Philippine National Police (PNP) chief Director General Ricardo Marquez, they will no longer focus on the said indiscriminate firing incident since it occurred outside the Philippines. Instead, the PNP will be focusing on other cases of indiscriminate firing in the country. As of 10 a.m. on Monday, January 4, the PNP has documented 41 stray bullet-related injuries without fatalities and recorded 54 stray bullet incidents since they started counting victims on December 16. A total of 9 people, 7 of whom were civilians, one was a policeman, and another one was a security guard, have been arrested due to illegal discharge of firearms as of 10 am on Monday, January 4. Police Officer 1 Francis Nepomuceno will be facing administrative charges for firing his gun.